What’s in the fabulous Excalibur Dehydrator today? Well, the house smells wonderful. It’s a true fall day with winter on it’s way here in Ashland, Oregon. We had a rain storm last night with some wind and now the air is clean and leaves are falling. I needed to bring my herb garden indoors so I decided to cut back my basil to use in the future. In the dehydrator I have basil, dill, chopped fresh cranberries, banana chips and red peppers. 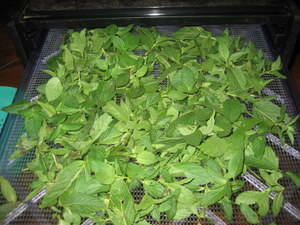 I love making good use out of the time the dehydrator is going, so it’s nice to have all these things going at once. It still amazes me that the flavors never cross over to each other. I made a new version of the Cauliflower Cous Cous as a side dish for later tonight, and am working on a raw granola breakfast bar recipe to try out for the morning. I want to hear what you dehydrate and what you make with it. I’m also calling for all unique but tested raw recipes.